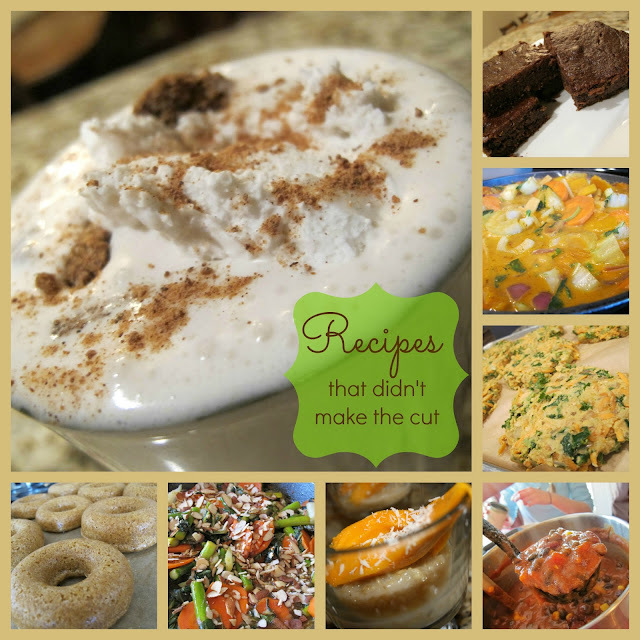 I was going through all my food pictures the other day and noticed how many pictures of ideas for recipes that we have tried that just didn't make the cut. Ryan said, "You should do a post with those pictures, just to show how you only post recipes that really are TASTY!" We are always trying new fun things and although it's always edible many times it's not worthy of being blogged. I want my readers to be confident that the recipes here are tried and true and that at least our family loves them. Is it Simple? Even if we have a recipe that we really love, but I find I never want to make it again because it is so complicated, then it doesn't make the cut. Is it Healthy? This is a given. Ryan calls me an Ingredient Freak. (I think he means it as a compliment) We don't even have bad ingredients in our home so I certainly can't put them in a recipe. Is it Tasty? I think food no matter how healthy should taste good. I do once in a while post some really health nutty recipes that may taste a little on the too healthy side but I let you know if they do. I have found that our bodies after a while start to like that really healthy taste. I crave it more and more all the time. But my biggest compliment is when people used to the Standard American Diet (SAD) tell me how good something I make is. They don't even think that it's healthy. I aim for that with most of my recipes. There you go now here is just a handful of some that didn't make the cut! Fried Green Tomatoes: These were okay but just okay. I think if I have green tomatoes I need to use I will try a green chili salsa with green tomatoes or something like that. Of course we have learned how to get our tomatoes to ripen quickly so I don't usually have a lot. Veggie Burgers: I'm working on a veggie burger that will freeze well for quick easy meals. These were super tasty but the texture was a bit soggy. I will get them figured out soon enough I hope. Baked Beans: For some reason I never really care for the baked beans I have made. I'm thinking they need to be pressure cooked to really infuse the flavors into the beans maybe one day. Baked Doughnuts: Alright I see no reason why there can't be a super tasty baked doughnut that doesn't taste healthy I will figure it out one day but these, they tasted more like a bran muffin or something. Creamed Peas and Potatoes: Alright these are super good they have just been runny the few times I have made them. I need to figure out how to get them just right. Raw Creamy Dressing: Every time I try a creamy raw dressing usually with a cashew base, they usually turn out only so, so. Not sure what I'm doing wrong. Gingerbread Milkshake: I was going for a blizzard type thing here. It was obviously good but the cookie got soggy and it was overly rich and the seasonings weren't quite right to much ginger or not enough. Lemon Glazed Asparagus: I thought this would be so good but it was way too sweet and not lemony enough it has potential though. Chewy Brownies: Now these could be good but I thought they were too strong on the applesauce. I'll figure out a good brownie recipe one day I will. Pumpkin Chili: I thought this would be great and then it just really wasn't. Not sure why. I may try again one day. Vegetable Curry: This had really good flavors just not quite perfected. I will have some excellent curry recipes one of these days. We love curry around here. Mango Sticky Rice: Tasted really good just the texture needs some work. Well now there you have it and there are plenty more where those came from. It's kind of a slow process because, well these are the meals I serve my family they don't really want to try the same thing every night. If one isn't perfect the first time it's at least a week or more before we try it again and that's if it has a lot of potential. Sometimes it's weeks before I get back to a recipe, sometimes I just forget about it until I see the picture I took. It's really quite a process, but I want you to be confident that the recipes here really are Simple. Healthy. Tasty. What recipe in this list would you like to see perfected soon? My family has been asking me to try and figure out how to make healthy doughnuts. I am not sure there is such a thing :) kudos to you if you can figure it out. And I have been making lots of salad dressings using avocado as a base. I made creamed peas and potatoes with a roux and pureed white beans, that seemed to work, or a vegan alfredo sauce and tweek it to your liking. One more question, how do you manage what you and your kids eat outside of your home? For example, friend's houses, church activities, scouts, etc. Do you take your own food, help your kids pick the healthier options there, or what? I feel like there is no good balance between the two worlds. Ashley: That would work. Mostly I don't think about trying the creamed peas and potatoes until it gets mentioned on some holidays. So I have only tried it a couple of times. I get your question a lot and the answer used to be that we took food with us wherever we went and never went anywhere hungry. And yeah have taught my kids how to choose good options. Most of the time leaders are very supportive and that helps lots. I have noticed though that my older kids are becoming less vocal about it so leaders don't understand and have been much less supportive. And that has made it a bit difficult. I try to communicate well with leaders but I have also tried to back off a bit with my older kids and let them communicate with their leaders. Although it can be hard I think it's good to help your older children decide how to handle things. I'll be honest they aren't always perfect and for sure don't make the same decisions I would. I do get frustrated that our culture is what it is and that I feel I'm fighting a loosing battle many times. I have noticed though that as I try to teach and not force and show the example that my kids do recommit and do better. They also know that I feel much better about them going to activities and things if I feel they are going to try and uphold our family culture. I think that is key right there. To have a family culture that they feel a strong part of. Otherwise they seem to want what to be a part of the world and what it and their peers have to offer. I could ramble on....but I'm not sure that I am making sense. And mostly It's still a learning process for me too.